Maybe it’s because I teach core subjects that students often hate (let’s hear it for mandatory French! ), but student engagement is a big deal for me. It’s a constant battle, and it often feels like an actual war of attrition, but getting students to give a (fill in expletive here) about what they’re learning just makes the day better. Students who care about what they’re doing are so much nicer to be around; they’re more motivated, their attitudes are better, and they show pride in their work. But know what’s even more important than student engagement? Teacher engagement. We’re human too. We react the same way to things that we care about. And some days – Halloween for instance – we need all of the motivation we can get in light of rowdy behavior and general sugar anticipation. How do we find that motivation? Well, we find a way to amuse ourselves. So, today I taught Potions. Yep. Potions. Just like Snape. 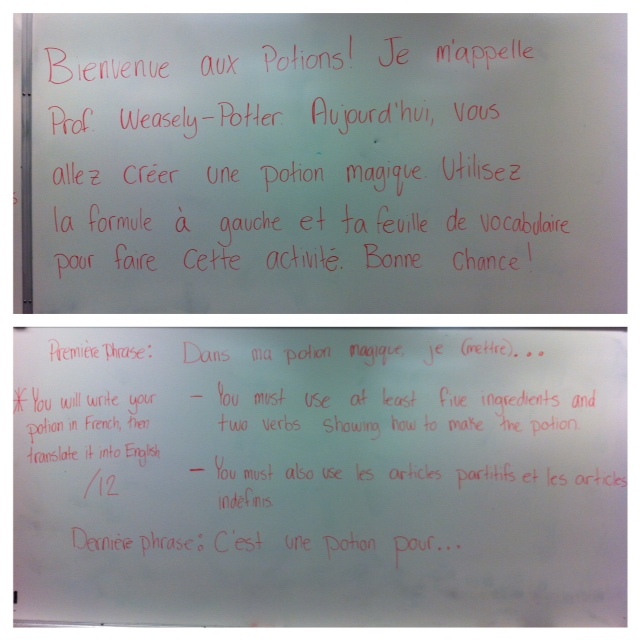 I dressed in my Gryffindor finest and had my students create magic potions using French partitive and indefinite articles. “Do you want to put a slug or some of a slug into your cauldron?” and “Okay, do you want to put in a rat dropping or some rat droppings?” were actual things that came out of my mouth today, and it was amazing. Were all the students engaged? Of course not. But I had fun – and I survived Halloween in a high school. ← Surrey International Writers’ Conference (of Awesome).